One of the most innovative, consistent and highly acclaimed cooperatives in Piedmont, Produttori del Babaresco produces exquisite, traditional Barbaresco(s) that are among the best examples of the appellation. This storied cooperative in Piedmont dates back to 1894; forced to close in the 1920s because of fascist economic rules, it was revived in 1958 by the village priest of Barbaresco who recognized that the only way the small properties could survive was by joining their efforts. Today the cooperative has 56 members and 250 acres of Nebbiolo vineyards in the Barbaresco appellation, which amounts to almost 1/6 of the vineyards of the area. In great vintages, nine single-vineyard Barbarescos are produced from 9 classic premium sites within the Barbaresco village boundaries; including established vineyards like “Pora”, “Moccagatta”, “Ovello” and “Rio Sordo”. Moccagatta is a 9.6 acres (3.88 hectares) single vineyard planted on slope at about 300 meters above sea level, with southeastern exposure and calcareous limestone soils. The first vintage was produced in 1967. The wine is aged for 36 months in large oak barrels and 8 months in the bottle before release. 10,000 bottles produced. 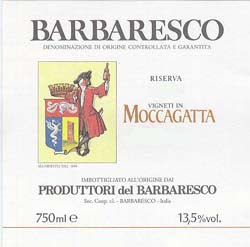 From another classic vintage, the 2004 Moccagatta is quite intense, aromatic and floral, yet delicate and gentle, somewhat feminine, and shares the same finesse of the Rabajà (single vineyard), but a lighter in body. Still quite young, the palate is focused and elegant with red and dark cherry fruit flavors, firm and present yet fairly integrated tannins that will need a bit more time to settle down. It is a keeper and will age nicely for the next 10-15 years easily. Pair it with fresh egg pasta dishes or mushroom risotto with black truffle shavings, but also with grilled red meat, game, venison and cheeses. Ovello is a 16.25 acres (6.5 hectares) single vineyard planted on slope at about 290 meters above sea level, with east-southwestern exposure and calcareous-limestone with clay soils. The first vintage was produced in 1970. The wine is aged for 36 months in large oak barrels and 8 months in the bottle before release. 18,000 bottles produced. The 2004 Ovello is quite rich and full-bodied, yet juicy and fresh at same time, which makes it really approachable now despite its youthful attitude. Here again, like for the Moccagatta, it is still quite young and promising, yet the palate is already focused with bright ripe red cherry fruit flavors, framed by firm and present yet fairly integrated tannins that will also need a bit more time to settle down. Fruit forward with good acidity and a long finish, it is a keeper and will age nicely for the next 10-15 years easily. As with the Moccagatta, you can also pair it with fresh egg pasta dishes or mushroom risotto with black truffle shavings, but also with grilled red meat, game, venison and cheeses. Rio Sordo is an 11.27 acres (4.6 hectares) single vineyard planted on slope at about 270 meters above sea level, with southwestern exposure and calcareous-limestone with sandy layers soils. The first vintage was produced in 1978. The wine is aged for 36 months in large oak barrels and 8 months in the bottle before release. 10,000 bottles produced. Medium to full-bodied, the 2004 Rio Sordo is elegant and complex, with bright juicy fruit, expressive flavors, silky tannins and a long finish too, which makes it really drinkable now despite its youthful attitude. Here again, like for the Moccagatta and the Ovello, it is still quite young and promising, somewhat austere, yet the focused palate is earthy with bright ripe red cherry fruit flavors, framed by firm and present yet fairly integrated tannins that will need a bit more time to settle down. Fruit forward, focused with a long finish, it is a keeper and will age nicely for the next 10-15 years easily. As with the Moccagatta and the Ovello, you can also pair it with fresh egg pasta dishes or mushroom risotto with black truffle shavings, but also with grilled red meat, game, venison and cheeses. These 3 stunning wines are beautiful examples of what Barbaresco has to offer and the level of quality aimed by this cooperative. and the importer website at www.viaswine.com where you will find more info about these wines.